The shamrocks in this St. Patrick' Day decoration hang down in 5 strands and feature a variety of green shamrocks. 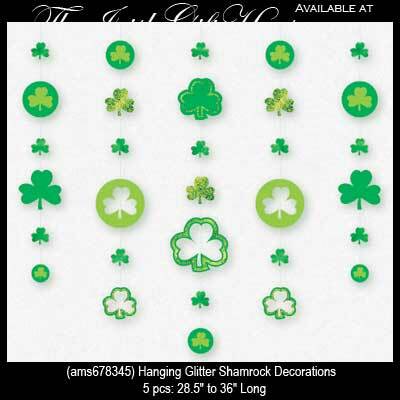 The 5 strand set of hanging shamrock decorations features different shades of green and both cutout and solid shamrocks. This St. Patrick's Day decoration from The Irish Gift House ranges from 28 1/2" to 36" long.